Jeddah, Kingdom of Saudi Arabia, March 08, 2018: Panasonic Homes & Living, in collaboration with its KSA channel partner Al Manara Electric Trading, is showcasing its latest innovations for the Electrical Construction Material space at The Big 5 Saudi happening until today at the Jeddah Centre for Forums & Events. The event is being held at a crucial time when the Saudi Arabia construction market is showing signs of renewed optimism after a slowdown due to low oil prices and fiscal spending cuts. According to the latest BNC Project Intelligence report, Saudi Arabia has over 4,700 active construction projects with a combined estimated value of US$ 852.3 billion. The urban construction sector has over 3,300 projects representing approximately 70% of all construction activities in the Kingdom, driven by the steady rise in the Saudi population along with growing urbanization trends. Panasonic Homes & Living offers a wide range of products for the construction segment like wiring devices, lighting solutions, low voltage control devices, Solar panels etc. 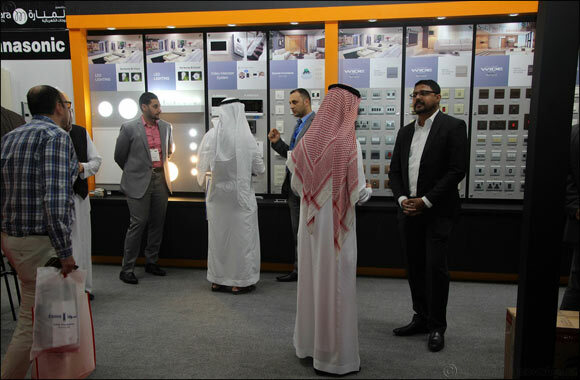 Key highlight of this showcase is the introduction of the brand’s Superior LED products for Saudi market and latest switches that come with super slim design, advanced switching technology and highly reliable safety features. Panasonic products come with luxurious appearance, an expanding range of options and wide choice of colour combinations to cater different customer needs, helping to create a style statement. Also on display is an entire spectrum of innovative technologies from Panasonic that include Video intercom systems, Low voltage control systems, Special functions to cater to different customer and industry segments. Panasonic has been strongly catering to the discerning needs of diverse customers in the Middle East Construction Sector. With its innovative products, the company provides smart solutions with unmatched quality to protect homes from various electrical hazards and improve daily living. The brand actions to deliver high quality options and these products are a reflection of the company’s commitment to offer best lighting solutions and wiring devices. Panasonic is at Stand 2G60 of The Big 5 Saudi at the Jeddah Centre for Forums & Events.